Posted on December 10, 2016 by Scott Johnson in Democrats, Who is Keith Ellison? Working from public documents and my own interviews in 2006, I constructed a picture of Keith Ellison as a serious long-time advocate of the Nation of Islam. This is the picture I drew of Ellison in “Louis Farrakhan’s first congressman” and in the companion Power Line post “Keith Ellison for dummies” just before his election to Congress in 2006. Ellison’s past and his continuing deceptions about it have emerged anew as open issues in connection with his current bid to lead the Democratic Party. Following Ellison, the Star Tribune portrayed Ellison’s involvement with the Nation of Islam as limited in time and extent. Explicating his May 2006 letter to the Jewish Community Relations Council, Ellison told the Star Tribune’s Rochelle Olson that he took up with the Nation of Islam for some 18 months around the time of the Million Man March in 1995. Olson occasionally regurgitated Ellison’s 18-month line as a fact and the Star Tribune’s Allison Sherry now cheerleads for Ellison in the same blinkered and misleading fashion. Since 2006 Ellison has always claimed that he was unfamiliar with the Nation of Islams’s doctrines and teaching. He knew nothing about the organization. He didn’t hear what Farrakhan was saying. He wasn’t paying attention. When he dressed like Farrakhan and showed up at meetings with looming black men in suits, well, it was just for effect. He meant nothing by it. This week the editor of the Nation of Islam’s publication The Final Call — one Richard Muhammad — denounced Ellison for his disloyalty to the Nation of Islam and the NoI’s great leader. 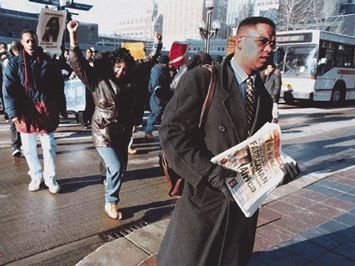 Muhammad included a photograph of Ellison distributing The Final Call back in the day when Ellison was working particularly closely with the organization about which he knew nothing (the photo above, credited to Ed Morrissey’s old blog, depicts Ellison on campus at the University of Minnesota in Minneapolis). Brent Scher noted Muhammad’s editorial denunciation of Ellison yesterday at the Washington Free Beacon. Scher’s note concludes: “Ellison is yet to comment on The Final Call editorial. His office did not respond to an email from the Washington Free Beacon regarding the piece.” Brent, don’t hold your breath on that one. I think my 2006 portrait of Ellison stands up better than Ellison’s apologetics.